Captain America 310, page 8. 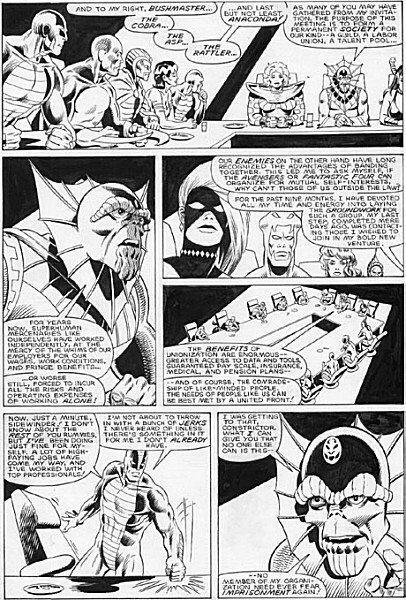 This page features Sidewinder in the act of recruiting and organizing the Serpent Society. Effectively, this is the second page of the Society's existence. As a fan of the group, I'm very happy to have this- some great Sidewinder close-ups to boot! Like my MTIO 5 page, this is one that really lights up for me at full size. As is usual for my non-MTIO stuff, this is another Mark Gruenwald production. As in the Squadron Supreme page I own, I also want to draw your attention to the word count here- there may be more words on this one page than there are in an average Marvel comic anymore. Whatever happened to giving your reader their money's worth? Interesting to me- the seller also sent along a photocopied page which seems to have been a photocopy of the original pencils, pre-inking, including pencilled-in dialogue over which the final dialogue was inked, and notes around the page. At the bottom of the first panel, for example: "begins meeting, Sidey speaks, only Viper not here." I'm not 100% sure whose notes they are, though Mr. Gruenwald seems the logical bet! This page was purchased through EBay in October of 2004.